A man called Nicodemus asserts that Jesus’ miraculous signs are evidence that he is a man of god. But who cares? In every other gospel, Jesus stated that signs were unnecessary and that only evil people would demand them (e.g. Matthew 12:39). So why does he waste his time performing stupid magic tricks like turning water into wine, anyway? 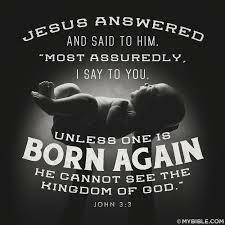 In v 3-7 Jesus elaborates on the concept of being ‘born again’. It’s all woo of course, but now we know where the concept originates. And he’s quite specific that no one can enter the kingdom of heaven without being born again, so I guess that settles the ‘faith vs works’ argument (for now, anyway – there will be a lot more flips on that before we reach the end of the NT). V 8 shows that Jesus – or the gospel writer – wasn’t very good at science. The SAB caught a contradiction in v 13 that I missed, because the wording in the NLT cleverly disguises the error. “No one has ever gone into heaven except the one who came from heaven – the Son of Man” (NIV) becomes “No one has ever gone to heaven and returned. But the Son of Man has come down from heaven” (NLT). Did you catch the change in meaning? It’s important because 2 Kings 2:11 clearly states that Elijah was taken up to heaven in a whirlwind. And then we get to the all-important v 16, probably the best-known bible verse of all time; it’s the one you see plastered on all the signs in the bleachers at sporting events. And as the SAB points out so cleverly: “it sounds nice, too, until you think about it. 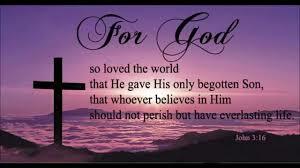 God had his own son tortured to death to prevent himself from torturing us all forever after we die. Believe and you have everlasting life. 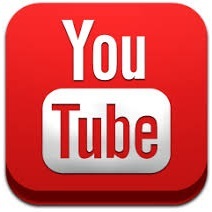 Disbelieve and you are damned to hell. That is the message of the gospel of John.” I have to agree. And it gets worse when you keep reading. V 18-20 describe divine judgement against those who don’t accept god’s ‘gift’ in v 16. In essence – god loves you; love him back or he’ll send you to hell. What kind of love is that? If it depends on threats and coercion, it isn’t love in my dictionary. The last portion of the chapter is just a bit of fluff about John the Baptist reiterating how important Jesus is; that he was sent by god; that anyone who believes in him has eternal life; and most importantly, as I see it, that “Anyone who doesn’t obey the Son will never experience eternal life but remains under God’s angry judgment.” (v 36). He couldn’t have made it plainer – most of the world is condemned to hell. There’s something not quite right about v 2, since it sort of contradicts John 3:22. 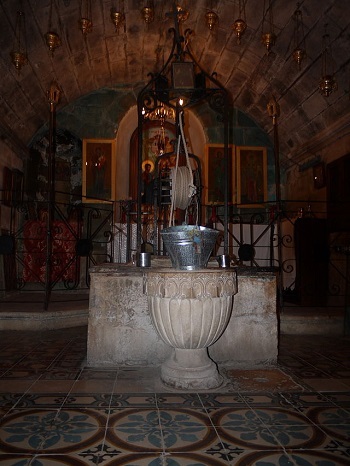 Jesus is tired and he sits down beside an old well – the very well that Jacob gave his son Joseph centuries before. Really? Is there any evidence of such a well? And how could Jesus have known that the well he sat by was Jacob’s well? In Genesis 33:18-20, Jacob camped near Shechem and bought the land on which he pitched his tent. Biblical scholars figure that he must have had a well there, and there is a well still there, in the West Bank. It is considered a Christian Holy Site, and there is currently an orthodox church on the property. 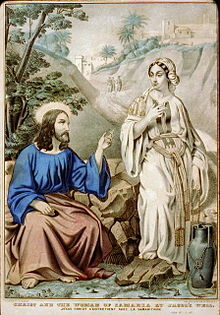 Jesus breaks taboos by talking to a woman (and a Samaritan), and as far as I’m concerned, he’s full of woo. He tells her all about the springs of living water – now I know why so many churches are given that name – and then he does a ‘cold reading’ (v 17-18). And she falls for it! Then in v 19-22 they get into a discussion about the differences between Jews and Samaritans. In v 26 Jesus declares flat-out that he is the Messiah. Did you catch that? He circled the question in previous gospels; John is much more direct. V 34-42 explain the roots of evangelism. The curious Samaritans flock to see Jesus, and Jesus comments that the fields are ripe for harvest. John and Baptist and Jesus have sown the seeds, and now the disciples are being told to ‘reap the harvest’ i.e. preach and try to convert all these people. Unsettling. At the end of the chapter we get a retelling of Jesus healing the son of the Roman officer (Matt 8 and Luke 7). But in this version, Jesus asks the guy “Will you never believe in me unless you see miraculous signs and wonders?” (v 48). Does anyone else find that upsetting? Does Jesus really heal the boy only to advance his own reputation? Shouldn’t he instead help people because it’s the kind and humane thing to do?